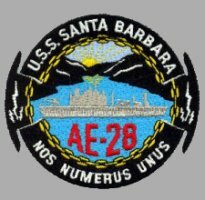 USNS SANTA BARBARA was the third ship in the KILAUEA - class of Ammunition Ships and the third ship in the Navy to bear the name of the seaside resort and residential city in southwestern California. 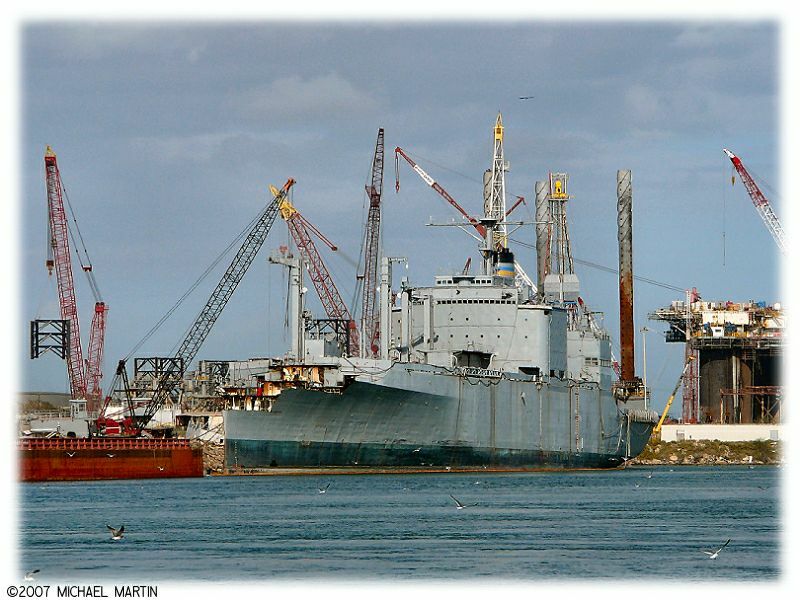 Transfered to the Military Sealift Command, the SANTA BARBARA was finally retired on August 5, 2005. 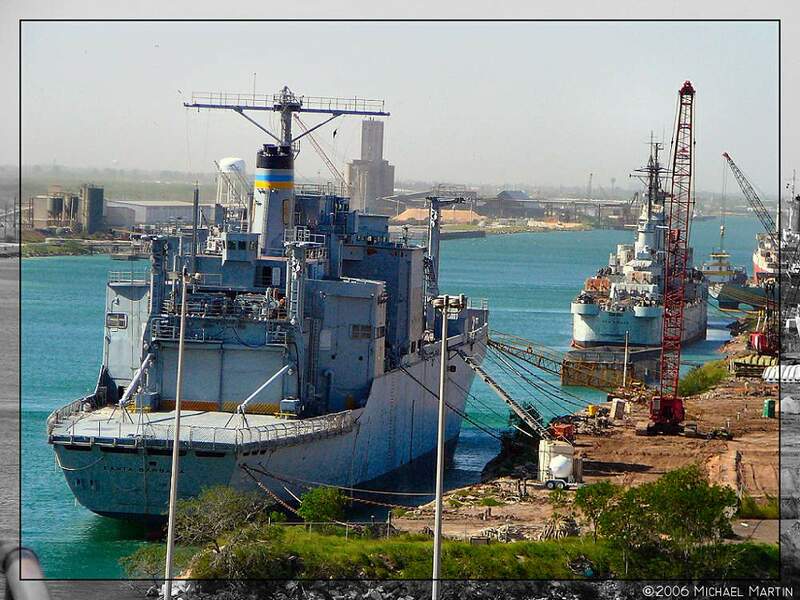 In 2006, the SANTA BARBARA was towed to Brownsville, Tx., for scrapping. Builder: Bethlehem Steel Corp., Sparrows Point, Baltimore, Md. This section contains the names of sailors who served aboard USNS SANTA BARBARA. It is no official listing but contains the names of sailors who submitted their information. 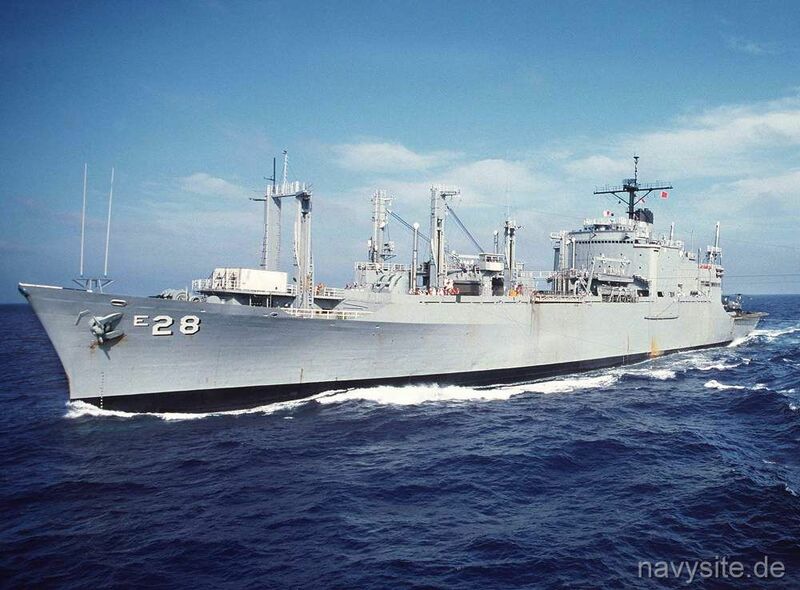 Click here to see which USNS SANTA BARBARA memorabilia are currently for sale on ebay. 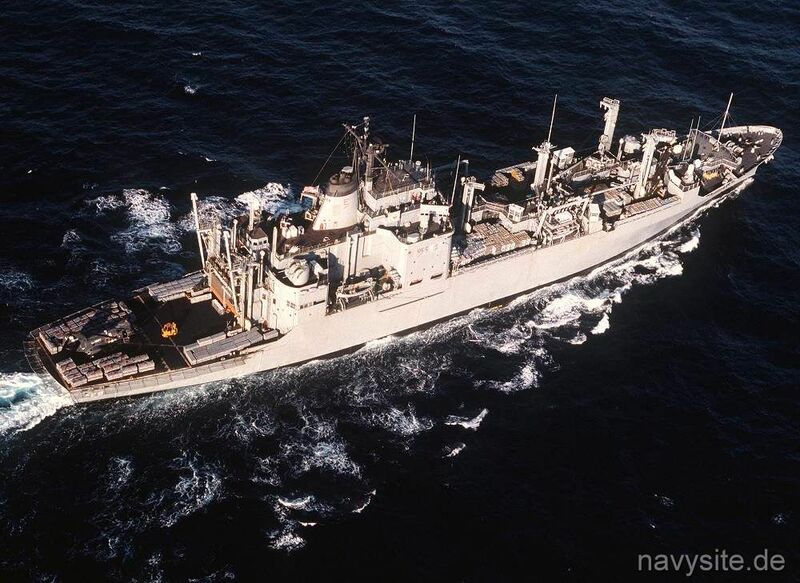 December 20, 1975 Charleston, South Carolina USS SANTA BARBARA suffers a Class Alpha fire while moored at Charleston, SC, without crew and ammunition in preparation for a regular overhaul. SANTA BARBARA's keel was laid on 19 December 1966 at the Sparrow's Point Maryland shipyard of the Bethlehem Steel Corporation, and sponsored by Mrs. Graene C. Bannerman at her launching on 23 January 1968. 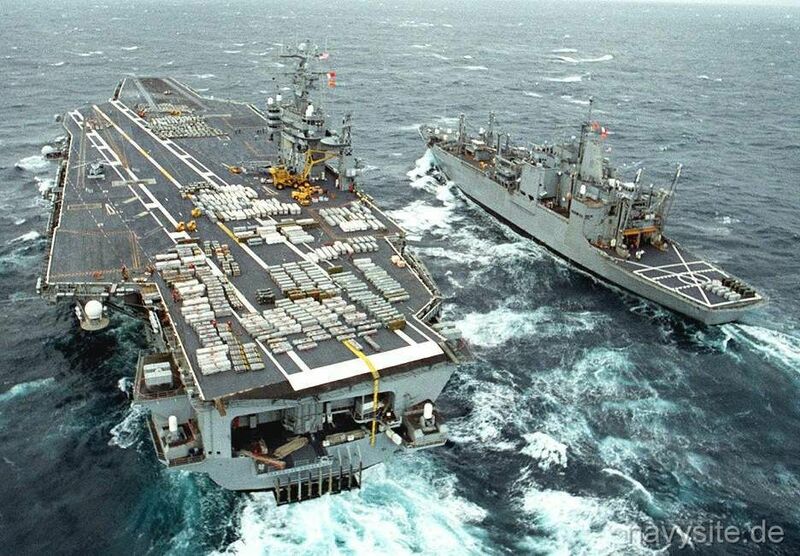 SANTA BARBARA was commissioned and joined the Atlantic Fleet on 11 July 1970. Originally home ported in Davisville, Rhode Island, her home port was changed to Charleston, South Carolina, one of America's oldest and most historic cities. Throughout the history of SANTA BARBARA, the ship and crew have gained an outstanding reputation as a professional and "can do" team. Her awards include Battle Efficiency "E" Awards won in 1979, 1980, 1989, and 1993 for exceptional performance from all departments, and superior overall ability. 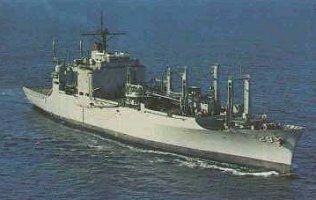 She was awarded the Meritorious Unit Commendation in 1973 for numerous records set replenishing at sea during the Vietnam Conflict, and again in 1988 for her performance during her 3-88 Mediterranean deployment. In 1989, she earned the Golden Anchor Award for the best retention in her class, and was parent command for the 1989 Surface Forces Atlantic Sailor of the Year. Her latest awards are the Maritime Warfare Excellence Award, the Engineering/Survivability Excellence Award, the Command and Control Excellence Award, the Logistics Management Excellence Award, and the Meritorious Unit Commendation for her performance during her 1992 - 1993 Mediterranean deployment. 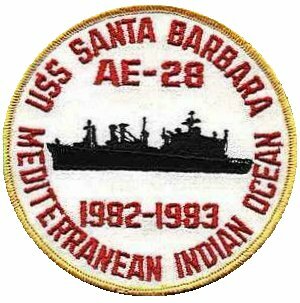 Decommissioned on 30 September 1998, SANTA BARBARA was transferred to the Military Sealift Command (MSC), Naval Fleet Auxiliary Force the same day and her hull number was changed to T-AE-28. As of October 1999, she was in a Reduced Operating Status and laid up pending overhaul. The photos below were taken and contributed by Michael Martin. 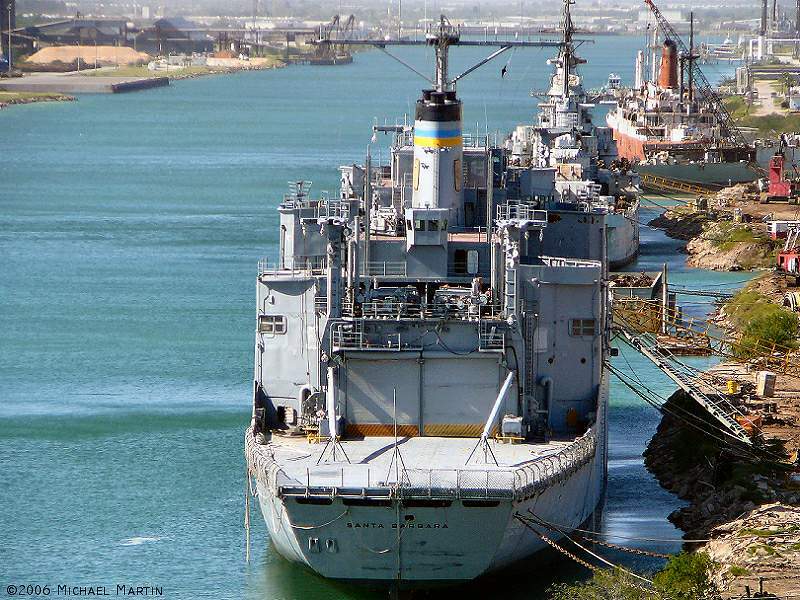 They show the SANTA BARBARA shortly after her arrival at Brownsville, Tx, waiting to be scrapped (the first two photos) and undergoing scrapping. The photos were taken on November 15, 2006, and on February 6, 2007. Back to Ammunition Ships Site. Back to ships list. Back to selection page. Back to 1st page.